UPDATE (4/21/2017): Hey all! It's been over a year since I uploaded Conception. I didn't think people would use it as much as I thought, but I'm glad others are getting use out of it. The prototype is crude, but it gets the job done and I find myself using it during every game jam. 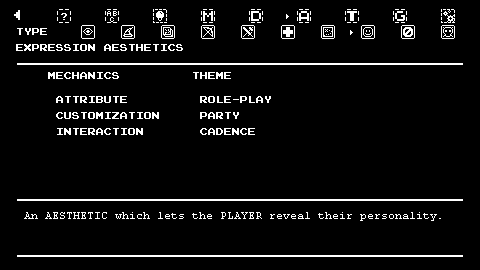 That being said, while playing with it in preparation for Ludum Dare 38, it's can easily overwhelm some people and can give "too much" information or might be too difficult. Hell, I don't use most of the stuff I put in there. So with that, here's some quick tips I've found to using it most effectively! If using it as a supplementary tool for a jam that already has a theme announced (say a mechanic like "one button"), I suggest using a random Topic only (the first line when you hit "generate") and do that about 10 times. 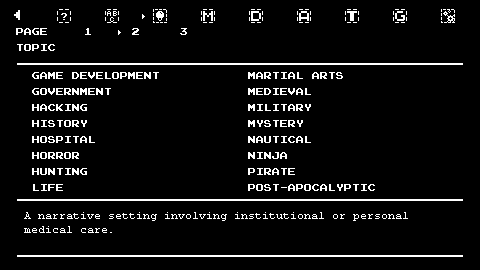 Match each random Topic up with the jam's theme and come up with at least one idea for each. You'll come up with good and bad ideas, but you'll be able to easily choose out of the 10 which idea you want to go forward with. 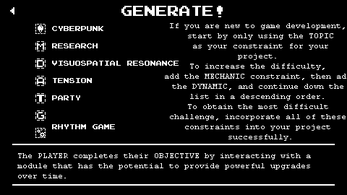 Similarly, if the theme is more of a narrative atmosphere (such as "world in the skies"), use a random Mechanic instead (the second line when hitting "generate") and again do that 10 times. The benefit is similar to the bullet point above. If working with a team, follow the bullet points above and instead of one idea per topic/mechanic, have each person come up with at least one and write it all down-- good or bad. Assess which idea is best for each mesh-up, and then from there choose an idea to work on. Usually, just that is enough to help me find an idea I'm passionate about. If there's any methods you find to using Conception, please share it in the comments~ Good luck! 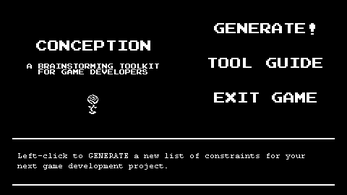 Conception is a tool for devs to use as a jump-starter for developing a game. 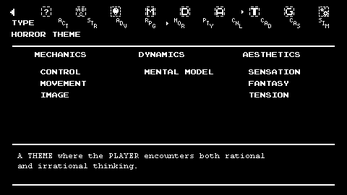 While only one person controls Conception's user interface through a mouse device, allowing a team of more than one person is another option for a brainstorming session. 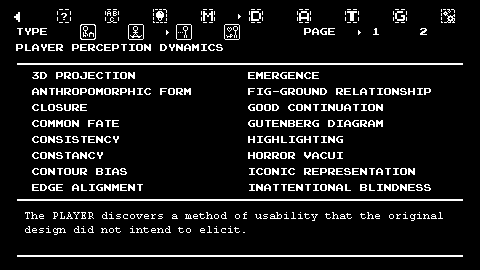 To use Conception as a brainstorming tool, the user selects the GENERATE! 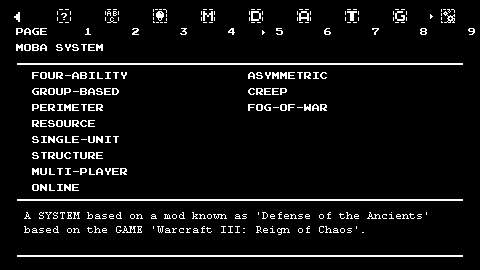 option which provides a randomly generated list of requirements for the creator to abide by. The list contains one constraint from each group: a topic, a mechanic, a dynamic, an aesthetic, a theme, and a genre/system. Once the constraints have been generated, the creator begins developing their game while incorporating those constraints. A topic is a game element defined by a narrative setting. This is the context and atmosphere of your project. 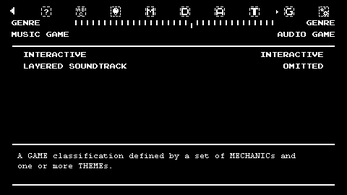 A mechanic is an interactive game element that occurs between the player and an object. This is the rule that the developer chooses to implement into a project for the player to comply with-- there is no game until a rule is set. 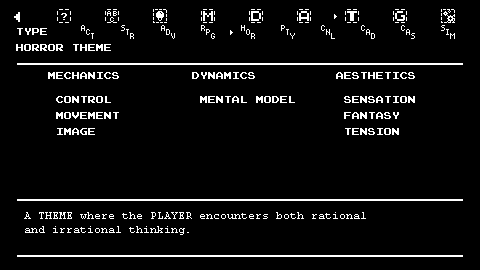 A dynamic is an interactive game element where a player uses the mechanics provided to pursue an objective. This is the verb that the player embodies while following a rule-- the player learns and uses the rules in a way the designer has intended. 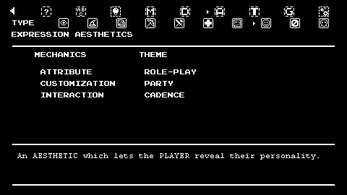 An aesthetic is an interactive game element where the player feels an emotion as a result of the player's actions. This is the reason why a player plays a game, and the end result all artists aim for-- the quality of the first and last (and everything in between) impression in which the player will remember the game by. Understanding these four fundamental groups, and how the end result of each game element can be polished to the utmost quality while staying within their given constraints, is the creator's goal. The time limit is self-imposed by the creator. The tools (software, paper, pens, etc.) that the creator may use to develop their project are also self-imposed, but understanding the tools' limits may play a large part in the creators' success. 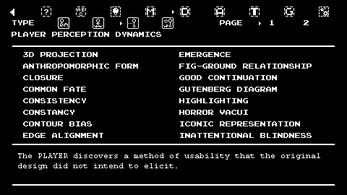 If a generated mechanic is not what the creator's tool is made for, re-generating the list or using a different tool is completely viable. 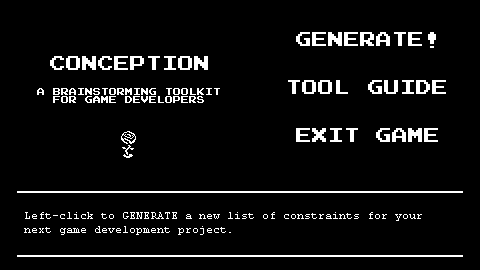 If the user/creator has a difficult time understanding a generated item, they may reference the TOOL GUIDE option built within the Conception toolkit. 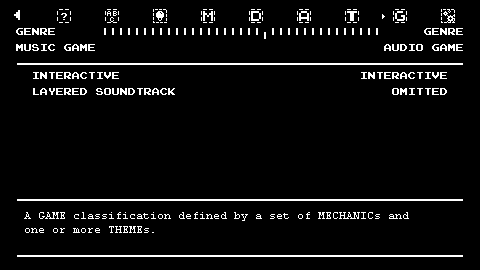 The Tool Guide allows the user to search through an entire catalog of available items within the toolkit, as well as a list of common genres and systems available for the creator to toy with at their leisure. Good luck! 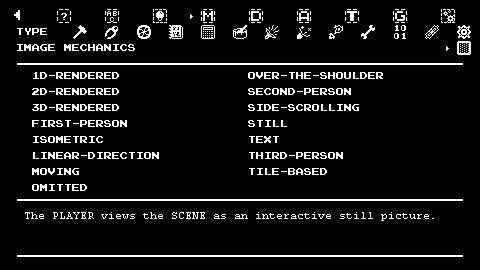 Great software for making personal game-jam kind of challenge! Motivation's been a bit of an issue with my current project, but not so much with Conception. I made it within a time limit so its pretty much staying where it is for at least a year or so-- I'm terrible at programming so even getting Conception to the state its in was really difficult. Though I pretty much pulled all-nighters for it, most of it was spent on research. And a lot of the code was repetitive and tedious, so even that wasn't so bad. The current project, though... I've already spent maybe half a year on design, art, and user research, but the programming is the biggest hurdle and motivation killer. ._. It's not my thing at all. I'll admit that its helping me think more logically though. I'm a game-designer myself, and while I'm pretty good with GameMaker and it's GML, coding is still kinda tough thing for me. It's fun, but really takes A LOT of effort.